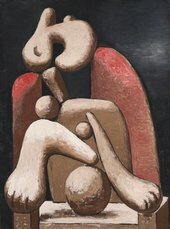 This is one of a number of pictures inspired by Marie-Thérèse Walter, a girl Picasso first met early in 1932, when she was only seventeen, and who bore him a daughter Marie (Maïa) in 1935. Picasso managed to conceal this relationship for many years even from his closest friends; his friend and dealer Kahnweiler, for instance, only learnt of her existence after the war. 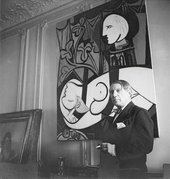 (On their relationship, which lasted until 1946, see Jean-Paul Crespelle, Picasso and his Women, London 1967, especially pp.137-42; an exhibition of the oils, gouaches, drawings, etc. 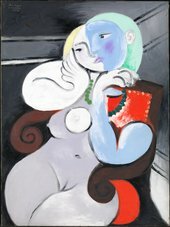 which Picasso gave her was held at the Galerie Jan Krugier in Geneva in 1973). She appears in a series of pictures painted in 1932 of a woman sleeping, lying down or seated, with very rounded, rhythmical forms, and can almost always be recognised by her lock of blonde hair. This particular picture was painted at Picasso's country property at Boisgeloup and is dated on the stretcher 27 July 1932. A pencil drawing reproduced by Zervos (op.cit., No.394) as a study for this work bears the date 30 July 1932 and therefore seems to have been done afterwards; it is even more curvilinear in design.